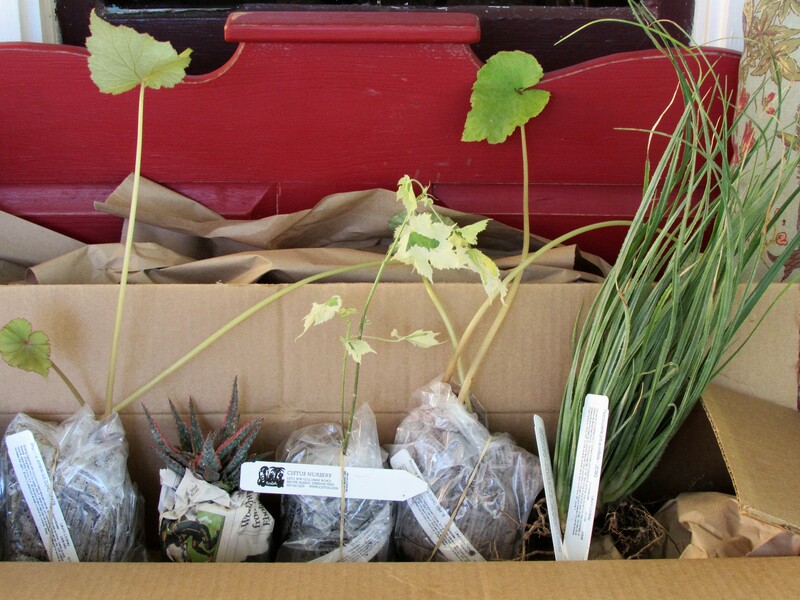 I Believe I Might Be Collecting Abutilons – Influences of the Garden Bloggers Fling in Portland. Today I am enjoying more beautiful winter color in the garden here at Ravenscourt. Outside on this beautiful Sunday I noticed lots of bright orange and yellow flowers tucked here and there. They are our abutilons in bloom. I became infatuated with these after attending the Garden Bloggers Fling in Portland. I remembered seeing them years ago outside a Chinese restaurant I like in San Fransisco. I find them charming in every way. 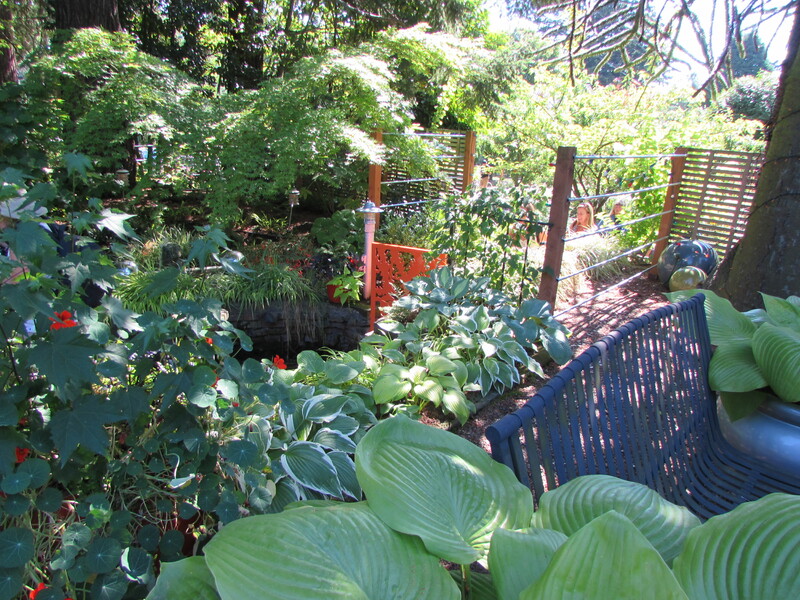 The fling in Portland changed the way I handled my shade gardens. I now have two more Japanese maples, five varieties of ferns, a couple of begonias, several hostas and, yes, abutilons. 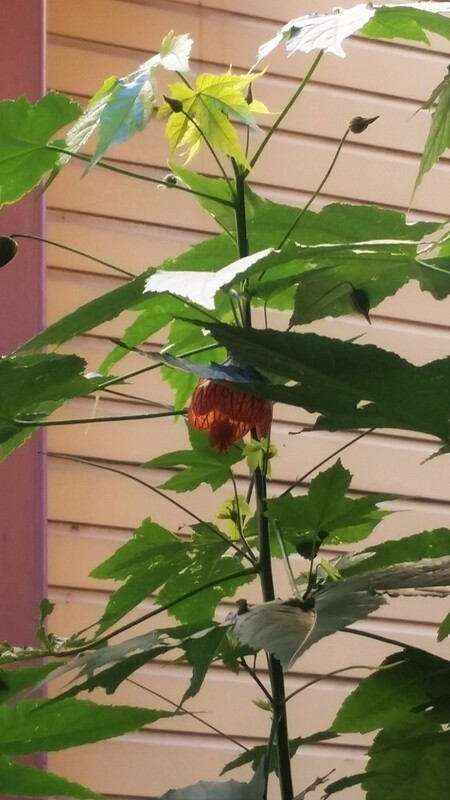 This is the first abutilon we planted when I got back from Portland. It is very happy but gets a bit leggy reaching for the sun. I think we need to prune it to get it to fill out. I found this great link on trimming abutilons by SF GATE. We will hold off until after it is done flowering. See all the buds : ) I have always loved these semi tender perennials because of the flowers but the leaves are beautiful too. 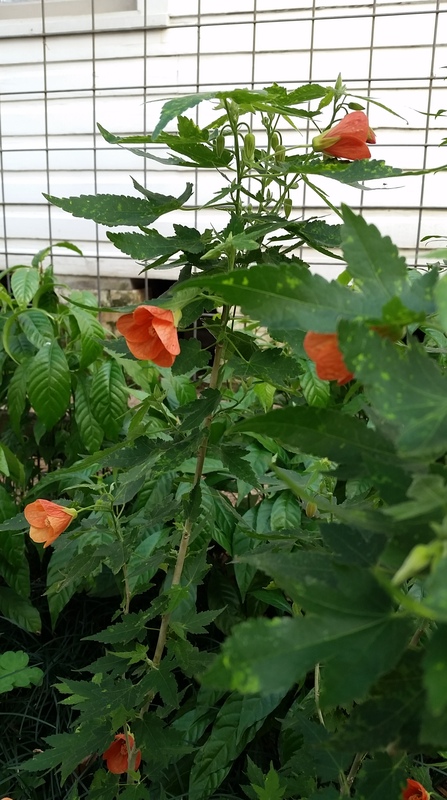 According to the World of Flowering Plants this one is also know as Red-vein Abutilon, Painted Indian Mallow, Red Vein Indian Mallow, Flowering Maple, Red Vein Flowering Maple, Red Vein Chinese Lanterns, Chinese Lantern. Portland was my first fling and it was overwhelming to my senses. I can’t imagine missing another one now as I have found touring private gardens, pubic gardens and amazing nurseries with other gardeners has been very beneficial to my design work. The second abutilon I bought from Cistus Nursery in Oregon. We had a fabulous tour of this nursery during the #GBFling14 and I wish I could just pop over and visit it when I wished. The one I saw there was large and tucked in to a border with lots of other plants. I looked for the picture I took but couldn’t find it. 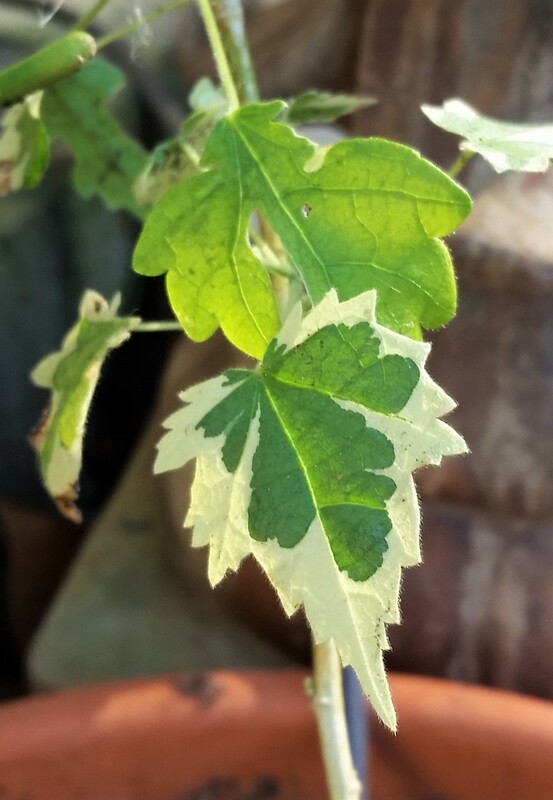 What caught my attention were these beautiful maple shaped leaves that were a striking green and white variegated. I decided I would see about ordering one. I recalled it being some kind of maple and with the help of Sean Hogan I found out it is not really a maple but often called a Flowering Maple. 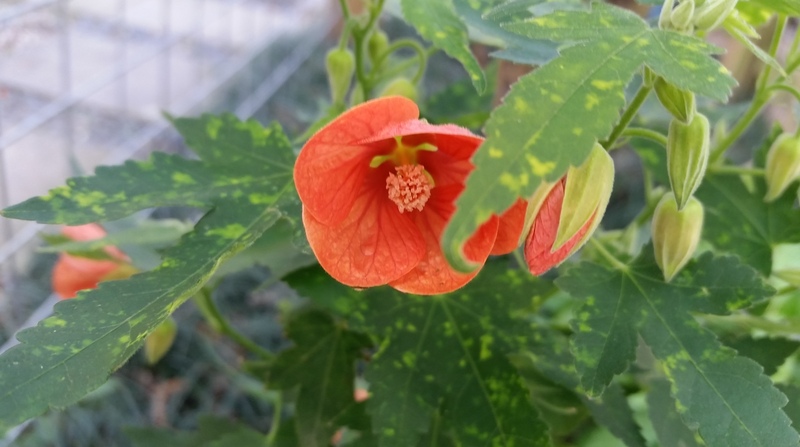 This variety is named Abutilon ‘Savitz’. It came in a 4″ pot and was about 4 inches tall when it arrived. It was so tiny I was afraid to put it in the ground but where it sat on the porch it has not done much better as it keeps getting its branches broken by our cat and birds. Looking for a better spot this spring. Check out Plant Lust for more details on the beautiful shrub. Last spring we came across a Aubtilon hybrid Lucky Lantern Yellow at Buchanan’s Native Plants here in the Heights. It was in full bloom and a must have. I had it in a pot at first but it wasn’t happy and nearly died. It is now planted in the ground and had come back and even flowered. Lucky Lantern is a dwarf variety that only wants to be about 12” tall. The flowers are good for attracting birds and pollinators. This variety is good in full sun to part shade but here with our summer heat intense sun I would avoid late afternoon sun. While I didn’t manage to keep it healthy in a pot it is supposed to do well in containers or even cascade in a hanging basket. I guess I never found the right location. One of the amazing gardens we toured was JJ De Sousa Gardens. Her front garden is shaded by towering trees. The combinations of leaves in this photo has stuck in my mind as I work on my own shade gardens. I remember these being Hosta ‘Guacamole’. And you can see the nasturtiums and abutilon leaves in the back ground with the lovely orange front gate. I even have two of these hostas in pots that I started from bare root I ordered online from Easy to Grow Bulbs. Mine have died back but should be bigger and better this second year. 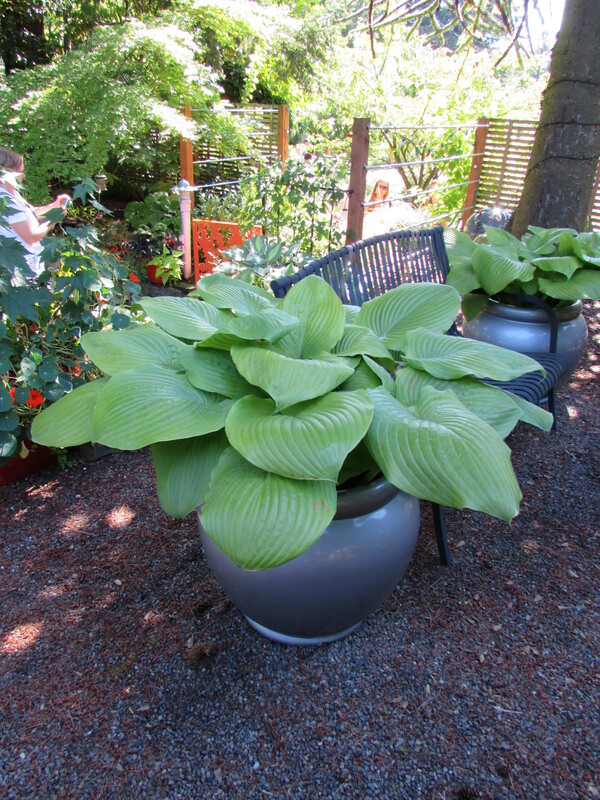 I have never forgot the huge hostas with there pristine leaves flanking the benches in this seating area. They certainly make a statement. I have never been attracted to orange until I saw this garden. And now I have more and more orange in my own garden. Here are Mexican Flame vine that have been blooming for several weeks now. They bright orange really attracts my eye as I head out the back door. This is the view from the stairs to the garage apartment. JJ De Sousa had wonderful little vignettes through out her garden. I like the way she combined objects and plants in entertaining and complementary ways. 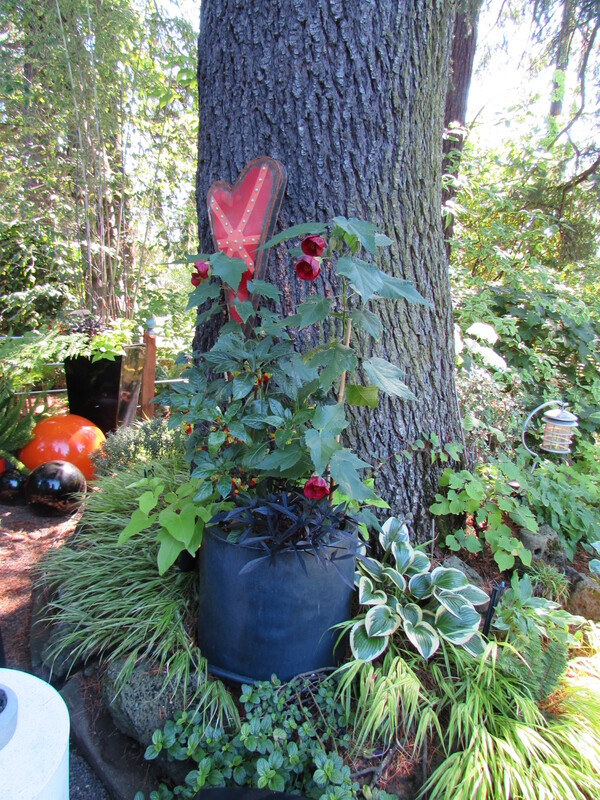 I love the heart hung near the container with deep read flowers on what I believe is another variety of abutilon. I have so many great pictures from this garden perhaps it is time to do a post dedicated to it! 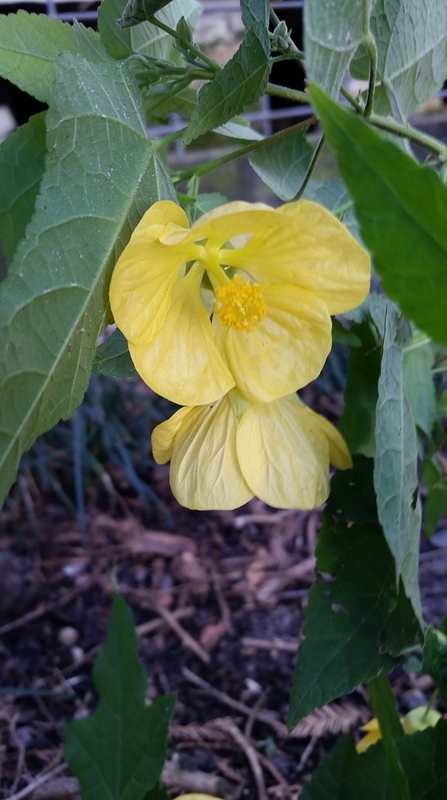 Looking back is so much fun : ) The newest abutilon to our garden is one Shawn found at Treesearch Farms. 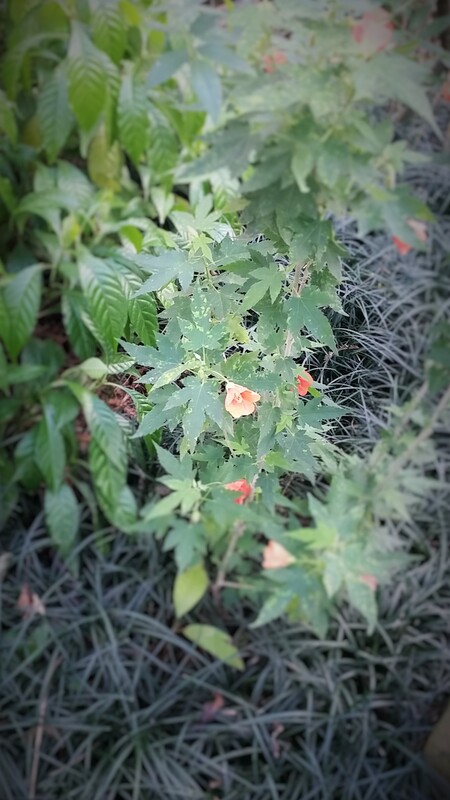 I believe it is a Salmon Variegated Abutilon. He doesn’t recall the name. We planted it in early Autumn and it is very happy and flowering like crazy. 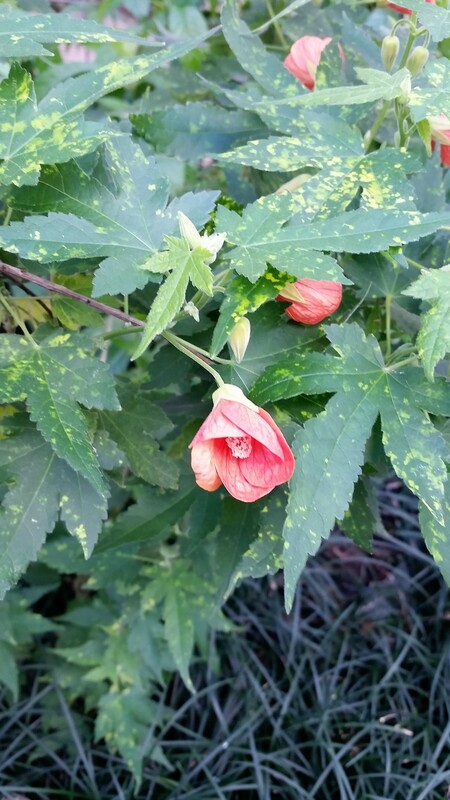 The flowers are a bit smaller than on the other abutilons and the leaves are slightly variegated but not like the abutilon “Savitz’. It was these flowers that caught my eye looking out the window and had me outside doing a little photo shoot. Here you can see the yellow dappled leaves a bit better. These photos are all taken with my phone so not best quality. Here you can see the whole little vignette with the Psychotria nervosa ‘Little Psyco’ coffee plant in the back ground and dark green Mondo grass underneath. Now I am off to put together some plates of or-devours and head to a neighbors for a Super Bowl party. The next one I hope to collect is Marilyn’s Choice Abutilon. This is a photo just outside our cabin at Stinson Beach California during Thanksgiving 2014. Great post Laurin! I’m so glad you were able to get that abutilon from Cistus and I love all our other selections, especially the last one. Sadly I won’t be joining up with the Fling this year, I’ll be counting on you to take lots of photos and share them! Oh we will miss you! If you are ever near Houston, I have two guestrooms and we have many lovely gardens to tour and some very cool Indy book shoppes! You have a great collection of abutilons. I love them too. They bloom for ages. I started collecting Abutilons when we moved here to the PNW from Massachusetts 6 years ago. That was when I started adding lots more orange as well. I never liked it or knew how to make it work back east. 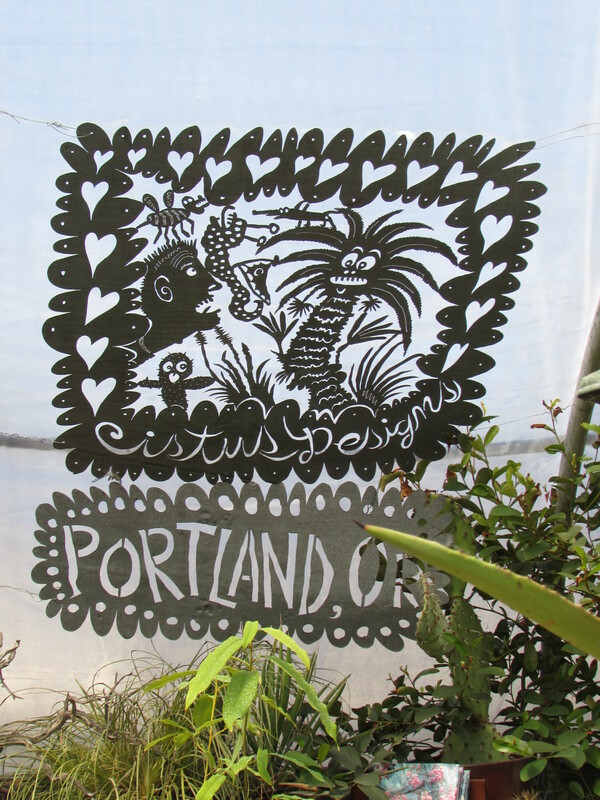 Love your phone camera shots, you picked some lovely ones, especially that one from Cistus. Yes, indeed, you are now a collector! I share your love for these easy to please (in our climate) plants that bloom so profusely! What a fun post! Great post, Laurin! I too, remain smitten by JJ’s garden and Abutilons. In our climate, unfortunately, many of the more tender ones don’t make it through winter. 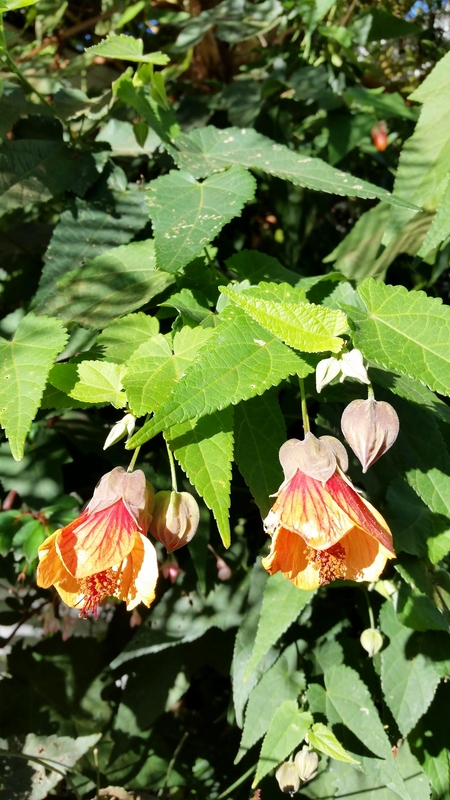 One I have found to be surprisingly hardy, is Abutilon megapotamicum. The flowers are quite different, and small, but pretty cute in their own right. 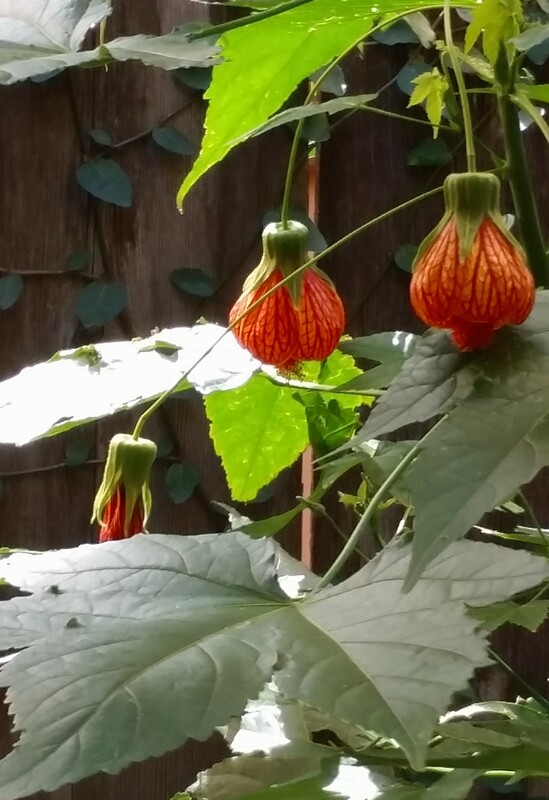 Thank you : ) I will look for the Abutilon megapotamicum, we are sub tropical so most the Abutilons are happy here. They do want to be constantly moist so I am careful about using them in designs where they might not get regular water. Like you, I have great affection for abutilons, and I’ve tried quite a few, with about a 50% success rate. My best performers are an unnamed pink one from Barton Springs Nursery, ‘Marilyn’s Choice,’ and ‘Souvenir de Bonn.’ Deep cold snaps have done in a few over the years, and too much sun (due to poor placement) have killed a few others. Placed correctly in dappled shade or even full shade, they prove surprisingly drought tolerant in my Austin garden. Great photos. 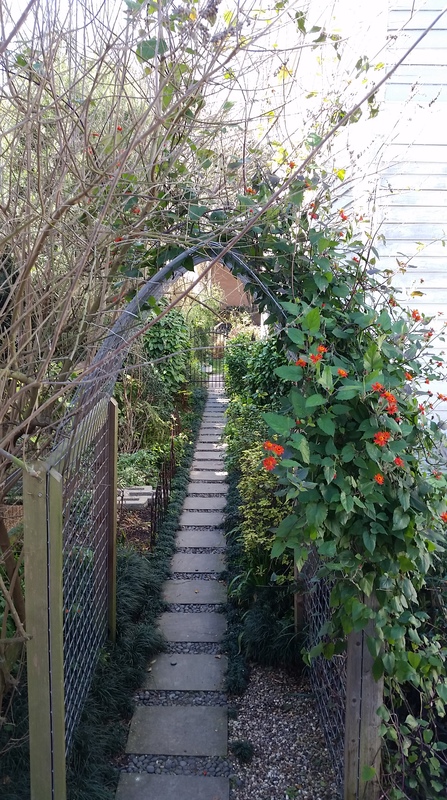 Love the arch with the Flame Vine. We call that arch the Queen Elizabeth Tunnel. Every time it rained the Purple Montrose Vitex would flop over and block our renter Liz’s way to her house about our garage. Seeing other gardens is such a huge influence and inspiration, isn’t it? Meeting other gardeners is also a lot of fun. This is a plant that I have seen, but didn’t know much about. Great to learn a bit more! I am such a fan of flowering maple. I’ve seen that orange one in a few plant catalogues and forgive the pun but I definitely am ‘feeling the burn’ for that colour. Maybe one of these days … I got a couple of very cheap unnamed yellow ones a few years ago. So lovely and so easy to care for as long as they are kept in pots. They like soil a bit on the acidic side and that definitely does NOT describe the soil on my site. ohoooh. That is good to know. Maybe I’ll try mine in the ground this year.